5-star Amazon.com and Barnes & Noble customer reviews! Buy this popular selling book now by clicking here: AuthorHouse, Amazon.com, or Barnes & Noble or the tabs on the upper right (also available as an e-book). “In his practical and inspiring book Plan Your Escape®, economics professor and world traveler Wayne Dunlap has written a manifesto to show you a comprehensive approach from visioning your trip to planning, packing, minimizing security risks, spending an average of $100/day. I love a book with checklists and action steps to keep me on track, and I found plenty included here, including an extensive packing list and a step-by-step 5-month planning and preparation guide. But the beauty of his advice is that readers planning shorter trips will also walk away with useful tips for their journeys. Dunlap tackles the nagging questions, concerns or excuses that keep us from realizing our travel dreams. For example, have you wondered how you’re going to come up with the money to fund your wanderlust? Dunlap details exactly how they managed their costs both before and during their travels. Concerned about staying safe and healthy on the road? The author tackles that, too, by providing tips and tools for maintaining a healthy lifestyle and minimizing security risks far from home. Each chapter begins with a brief summary of the chapter contents with motivational and inspirational quotes sprinkled throughout. As an added bonus, Dunlap includes travel advice from experienced travelers he and his wife have met along the way. 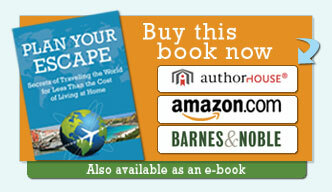 “Great resource for aspiring world travelers! Trying to figure out how to change your life from being a nine-to-fiver to a adventurous world-traveler can be overwhelming. This book is your ticket to taking the leap! It outlines everything you’ll need, in a format that makes the transition within your reach. From what to pack, how to travel affordability for extended periods of time, ways to automate your bills/obligations at home while on the road, and how to document your travels through blogs and photography – nothing is forgotten! The checklists are indispensable for preparing for your trips. You’ll read this straight through, and then keep it around to reference again and again for planning future trips. “Over the last 15 years of my Literary Agency rarely have I seen an author give an audience the VALUE they receive in Wayne Dunlap’s book, PLAN YOUR ESCAPE®. From HIDDEN SECRETS the Travel Industry doesn’t want you to know to MONEY SAVING TIPS and even how to FALL in LOVE with your significant other again, PLAN YOUR ESCAPE™ has it all! “WOW!! What a resource! I think it can be of really great value to anyone who has a weekend to spare on an international business trip, to students studying and traveling abroad, and couples looking for ways to stretch their dollars on their annual 2-week vacations. I’m very interested in trying all the suggestions for packing lighter. There’s almost nothing I hate worse than running through an international airport trying to catch a connecting flight while carrying and dragging what seems like twice my body weight in clothes and travel paraphernalia. And traveling to a destination via a repositioning cruise! What a way to start a vacation. No jet lag. No sleeping in a chair (unless it’s on a deck). Breathing only fresh air with time to do more homework on sites to visit. My wife Paula and I will certainly try this. “Everything you need to know for travel…and more!! It is a real pleasure to see this work finally in print!! I had the pleasure of meeting Wayne and Pat whilst on their travels and have to say that from the humble beginnings of the travel blog to now is no mean feat. It was truly an inspiration to speak and spend time with these two people who had already been a success in their business and personal lives to them realising that there is more out there to experience…and for them to actually go and do it! It is a treat to know that all the knowledge they have accumulated on their adventures can now be shared with the masses! Everything that is written here has truly been experienced and lived by Wayne and Pat. This book has a phenomenal wealth of information that you wouldn’t find in any normal travel guide from budgets to relationships to how to pack and this is because the viewpoint they are coming from…this is no gap year guide, it’s a way to take control of your life and gain the freedom you’ve always wanted but been too scared to go for. Being a traveller myself, I have found there are things I wouldn’t have even thought of and picked up a number of tips to ensure my travels go more smoothly…definitely areas such as house exchanges and repositioning cruises. Copyright © 2011-2015 Wayne Dunlap Plan Your Escape All rights reserved.